Ryan and went out together last Saturday, and poked into Parker Lake to see if the reds were gathering there, yet. Sure enough, we passed a small school on our way in, but we headed past them, back to the southwest shoreline, where few boats ever go. We could tell that the fish were there, but our hearts were elsewhere; so after registering the fact that Parker Lake was "on," we left and headed north toward the East Cut. Running about 9 miles north of the mouth of the Arroyo, we skimmed across the shallowest and most remote portions of the Lower Laguna, where boats rarely go because it's not on the way to anywhere. We had gone out after the sun had risen, because Ryan had awakened with an upset stomach. I'd waited by the boat, watching the fog roll in and then lift above the Arroyo, giving us a clear view of the water ahead. It was fortunate, in one sense, that Ryan had arrived so late. For not only did it save us from the impulse to run in the fog but it gave the sun time to burn off the low clouds until the day finally became cloudless. We stayed in one area for the rest of the day. The tide was very high, a spring tide that had pushed water way above the shelf. Normally, we fish in 6-9 inches of water, but the cloudless sky enabled us to fish in slightly deeper water than usual. 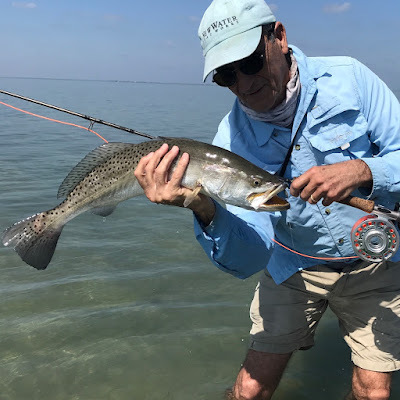 Since we saw big trout and reds running, we came off of plane, staked the Stilt, and proceeded to wade northward, with the sun at our backs. Rosie was with us, and she didn't hesitate to jump off the stern and join me on the first of three long wades. Ryan and I agreed later that we never lost our focus--that there were enough fish to keep us attentive and eager. The reds were very sensitive, as they often are in March and April. I'm not sure why, but it's typical for reds to spook so far out that even the best casters cannot reach them before they turn. They weren't that spooky, but they were very sensitive to the fly, and often reacted to a near-perfect presentation. And then, when they chased the fly, they often nipped at it, or turned off before taking it. It was challenging, to say the least. But the highlight of the day were the large trout cruising on the sand. I had three shots at 24+" trout. I missed one, lost one, and landed one--which is about as good as it gets. In contrast to the reds, the trout were especially aggressive. Indeed, when I saw the one I caught approaching me, I casted to her and the fly landed about 6 feet from her. Thinking that she wouldn't see it, I lifted my rod to make my back cast, only to see her rush forward after the fly as it left the water. I casted the fly again, and this time it landed about a foot ahead of the frustrated fish. She came to the surface and exploded audibly on the fly. A few minutes later, I released her after getting a couple of photos. The big trout are typically on the sand until about mid-May when they begin to spawn. At that point, they gravitate toward the grassy areas nearer deeper water, and spawn once a week or so until the end of the summer. The spring is a special time for seeing big trout on the sand. It takes a lot of skill, and even more luck, to entice one of these consummate predators. They are in a category by themselves. Good luck in your quest.